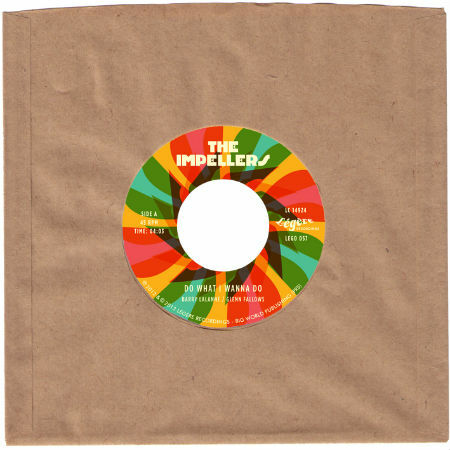 Following their acclaimed second album “This Is Not A Drill” (out on Légère CD/DL and Mocambo LP), ten-piece funk/soul powerhouse from Brighton (UK) The Impellers return with a slamming 7inch vinyl release. ”Do What I Wanna Do” “is a perfect blend of deep funk, latin and afrobeat, with massive piano and guitar riffs meeting crazy afro adlibs and a peak-time singalong vocal. While “Signs Of Hope & Happiness” changes gears and mood, with its a beautiful soul-drenched ballad on which the vocals of leading lady Claire are front and center stage. Both tunes turned out to be the two favourite tunes from their second full-length, kicking up a storm during the band’s live shows and enjoying radio airplay around the world, with “Signs Of Hope & Happiness” being voted by the listeners of German of the “Musikclub” show on nationwide WDR radio as one their top tunes during 2012.